However, the city has not solicited any alternative visions for Congress Square Plaza. 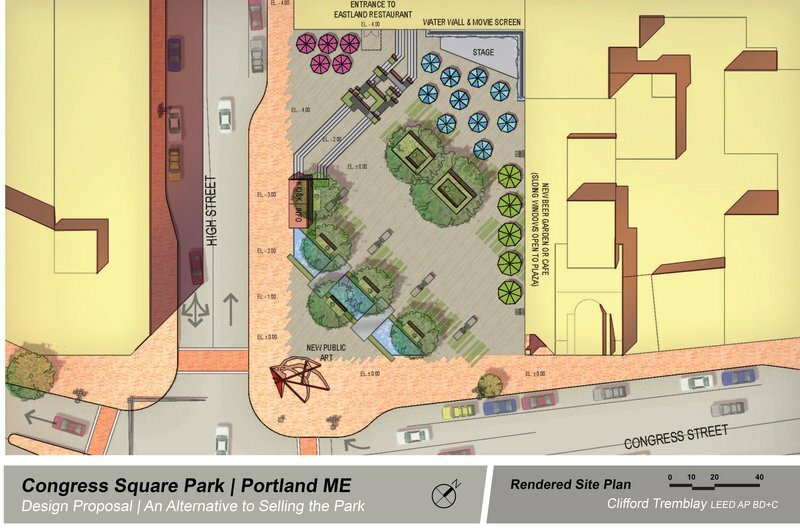 PORTLAND – As the City Council heads toward a vote next week on the proposed sale of Congress Square Plaza, at least two architectural firms have drafted compromise proposals that they say would improve the park while still allowing for a hotel expansion. The plans include everything from outdoor seating to a fountain to an elaborate grassy slope facing Congress Street. The city has not solicited alternative visions for the plaza, however, and no one has hired the firms to draft plans. The architects said they hope their unsolicited plans will compel the public and city officials to consider more options for the plaza. The City Council is expected to vote Monday on a proposal to sell 9,500 square feet — roughly two-thirds — of the nearly half-acre park at Congress and High streets to Rockbridge Capital so it can build an event center next to the Eastland Park Hotel. That would leave 4,800 square feet for a small urban plaza to be designed and built by the city. The proposal has ignited passionate debate on both sides. Supporters see the sale as a way to clean up a failed urban space and provide a new event center that could boost downtown businesses. Opponents decry the potential loss of a downtown open space and the precedent that could be set by selling city-owned open space in the downtown. Both sides agree that the current configuration of the plaza — a hard-scaped and sunken design that faces away from the street — is not working. However, two architects familiar with the plaza said the city’s options should not be limited to the proposed sale or the status quo. “Options are an important part of the debate,” said Andre Guimond, a Freeport native who co-owns the New York City design firm, PRESENT Architecture. The architects’ designs are different, but both include some expansion of development along with changes intended to improve access and appeal to pedestrians. “What we’re trying to prove is that the city can have it both ways,” Guimond said. Neither design comes with a cost estimate. Guimond and his college friend Evan Erlebacher, both 33, have been in town working on a project to rehabilitate a nearby building on Congress Street and had been examining the plaza as they walked past. “We started discussing how it was unfortunate that this great location in downtown Portland across from the art museum was so underutilized and so underappreciated,” Guimond said. 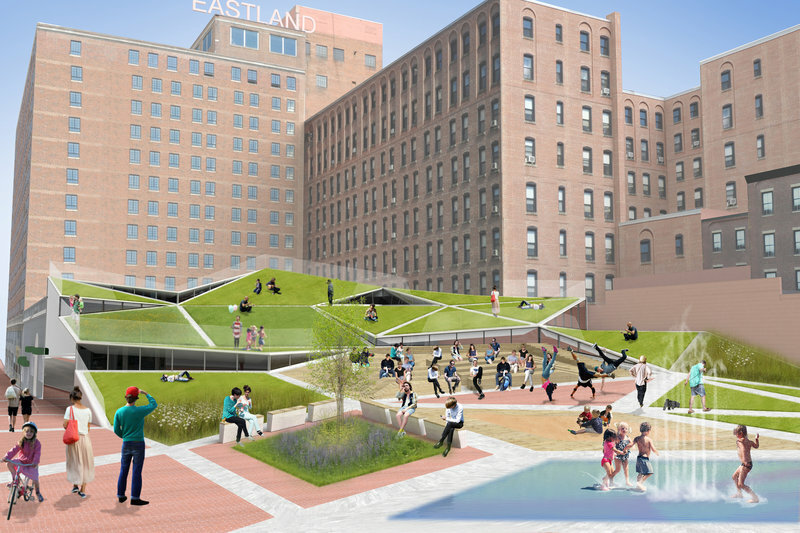 The firm recently released a rendering of a development in the square that would preserve the existing amount of open space by building a park that slopes upward from Congress Street onto part of the roof of a new building. The building could be used as an art gallery, community space or event center, Erlebacher said. The grassy slope would be built to safety standards outlined in city codes. There would be public art, a fountain and plenty of green space and seating for the public. Tremblay has drafted two different visions since he moved here in December. His first design was less concerned with cost and more focused on possibility. It includes slate pavers and a significant water element with steel bridges. There would be outdoor seating in the park, as well as outdoor tables for the hotel’s restaurant and the adjoining building on Congress Street, which is expected to reopen as a restaurant. A stage would be located in the back corner. 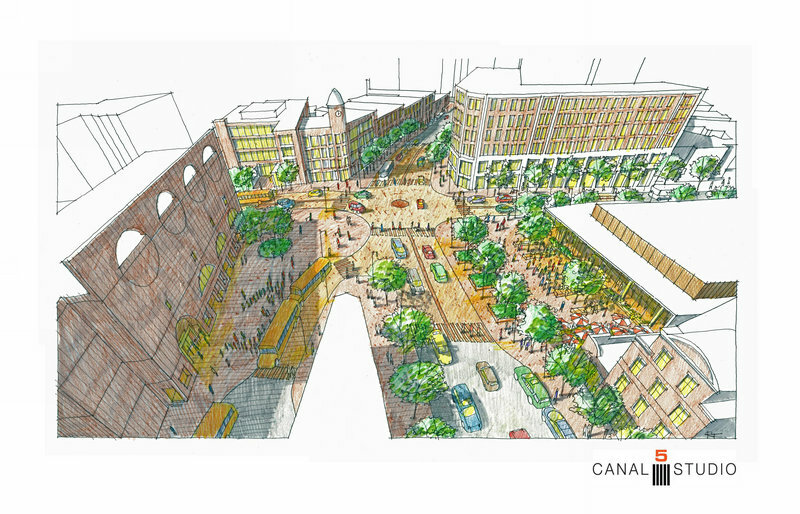 Tremblay, 32, recently reworked that design to reduce the cost and account for elements of Rockbridge’s proposal that he believes have public support. For example, Tremblay envisions the new event center being built on top of the existing single-story building. The center would be accessed by a new glass entrance in the far corner of the park, which would be topped by the Union Station clock that now sits on a different piece of the park. The surface of the park would consist of a grassy area and brick pavers that would create a cut-through path from Congress to High Street. A large chessboard, or other form of public activity area, would also be incorporated, as would art and a fountain. It also envisions using a shipping container for a retail use or an informational kiosk, and retains the outdoor restaurant seating. The new design also converts all of Congress Square — the intersection of Congress, High and Free streets and adjoining sidewalks — into a “woonerf,” a Dutch term that means living street where bikes and pedestrians have the legal right of way over vehicles. 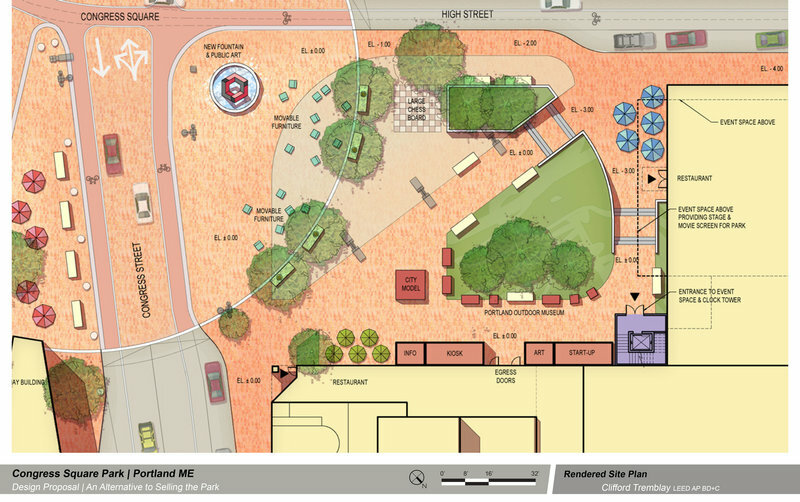 The woonerf was included in Rockbridge’s vision for the square as a way to make it more of a gateway and more bike and pedestrian friendly. The city has been negotiating exclusively with Rockbridge about developing the plaza since it bought the Eastland in 2011. At that time, the city had tabled plans to find a firm to redesign the plaza as a public space — an action that was endorsed by a special committee and had a $50,000 set-aside. The city has since launched a greater planning effort for Congress Square as a whole that would include a redesign of the plaza — whether at its current size or smaller, post-development footprint. Neither Tremblay nor PRESENT was aware of Rockbridge’s proposal when they began their proposed redesigns. But now that a council decision seems imminent, their efforts have taken on added urgency. Tremblay has put out his own call to other designers to offer their ideas about the square and more than a dozen designers have shown interest. “I don’t think it’s a lost opportunity,” Tremblay said.